I finished my warm and cool string quilt top late yesterday afternoon, and finally got it pressed for a good photo today (although the relentless breeze in the air still created some ripples). It turned out shockingly busy and loud; and I totally love it! 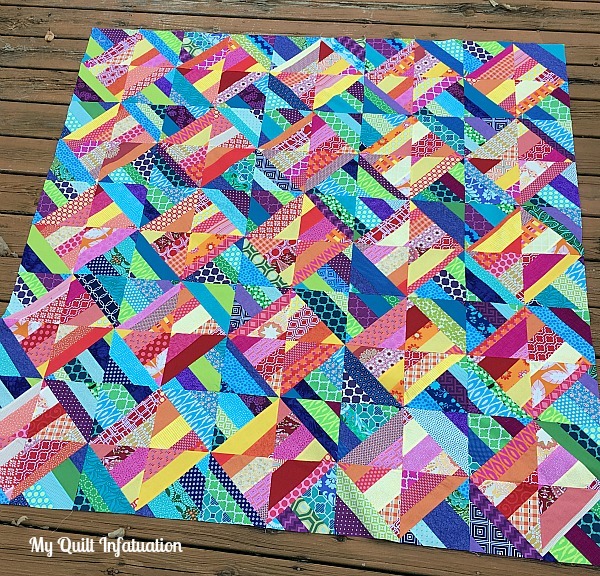 This quilt was an amazing scrap buster and it was lots of fun, easy sewing. When I started working on the warm blocks though, I realized that since my summer scrap purge, I had actually not accumulated any pink scraps, so I had to cut into some of my stash, and of course, I cut way too much. So, I should say that this quilt was a great scrap buster for all of my colors except pink. I pieced the backing this afternoon, and tomorrow I am going to work like mad to get it finished in time for my guild meeting on Sunday afternoon. I'm thinking that if I shirk enough housework that shouldn't be a problem, ha! I really like it! Great colours! Beautiful!! Love the effect of warm and cool!! It is loud, it is beautiful! Oh I love it! It looks like a party! The fabrics are busy, but the separation of color makes it work. Bold, bright and fun! This quilt makes me all kinds of happy. Love it!!!! Lovely, makes my eyes scatter about its surface. I LOVE this quilt! Gotta make one. Thanks for sharing. This is my kind of quilt ... bright and colorful. It's absolutely beautiful! The top turned out amazing. It is very beautiful. I look forward to seeing more of it. I really love the colours. Very nice. A fantastic use of scraps. I love the way it turned out!